Ludlow, VT –For the first time ever, Peace Park — a unique, ever-evolving elite snowboard park that expands beyond traditional competition-style courses — will host a qualifier event at Okemo Mountain Resort in Vermont March 11-12. 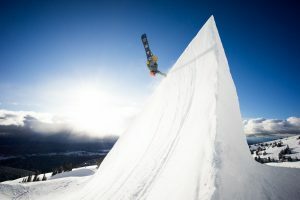 The qualifier will offer a select number of amateur snowboarders an opportunity to earn a spot to attend the Peace Park event in April at Grand Targhee Resort in Wyoming. Peace Park originated six years ago when Davis imagined a place that transcended standard slopestyle and halfpipe courses. Since then, he has continued to team up with Mountain Dew and his friends at Snow Park Technologies (SPT) to create one-of-a-kind courses that merge superpipe transitions, park jumps, and banked slalom berms with skatepark and surf-inspired features. The variety of elements and options aim to push style and creativity to the forefront like no other event in snowboarding. Registration for the Okemo Peace Park Qualifier opens March 5 at Okemo.com. Competition eligibility requirements, contest format, and judging criteria will be available on site and online.